Such a London bus. 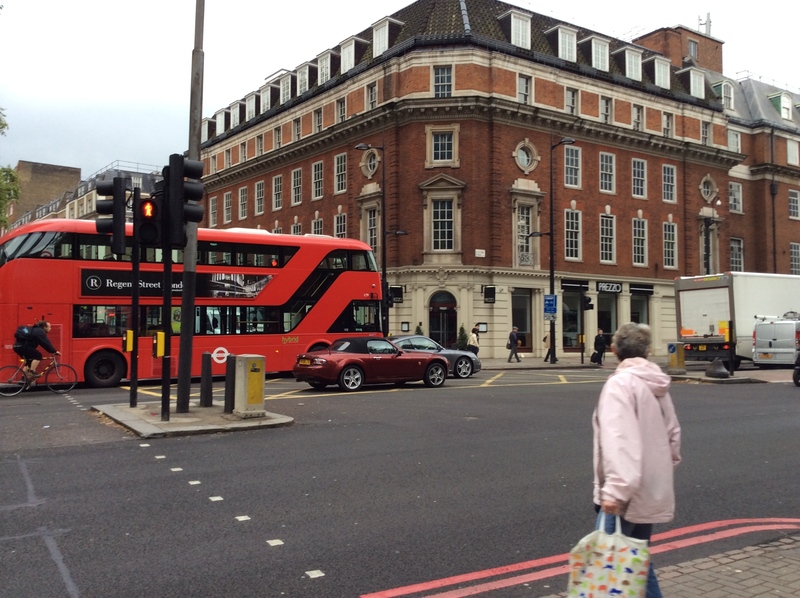 And a very London building near Euston Square. I’m in a very Browningish mood. I went to London for 24 hours last Thursday. I love London. I love England. I wish I could have stayed longer, but there you have it. I have an unusual eye condition that occasionally demands very quick treatment (a shot in the eye, so the less said the better for those of us who are squeamish. The bright side of it is that I can determine with authority whether any given situation is, or is not, better than a sharp stick in the eye.) The two French doctors who are experts in it were unavailable for a week, so one of the great London doctors at Moorfields Eye Hospital, near Euston Square and the University of London, moved heaven and earth to fit me into his schedule. Gratitude to those guys and their wonderful staff doesn’t begin to express my feelings. 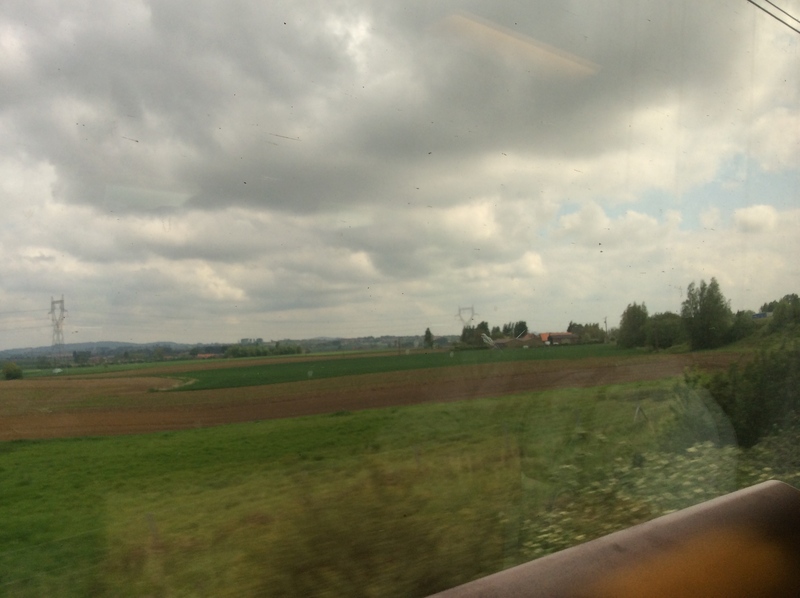 French countryside flashing by at 200 mph, trying to be sunny. 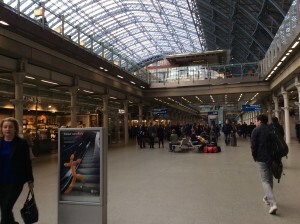 So I abandoned my dear friend and houseguest Tryna and hopped on the fast train (the “Chunnel” [=Channel Tunnel] train) that runs from Paris Gare du Nord straight to London St. Pancras Station, adjacent to Kings Cross Station where the Hogwarts Express leaves from Platform 9 ¾. 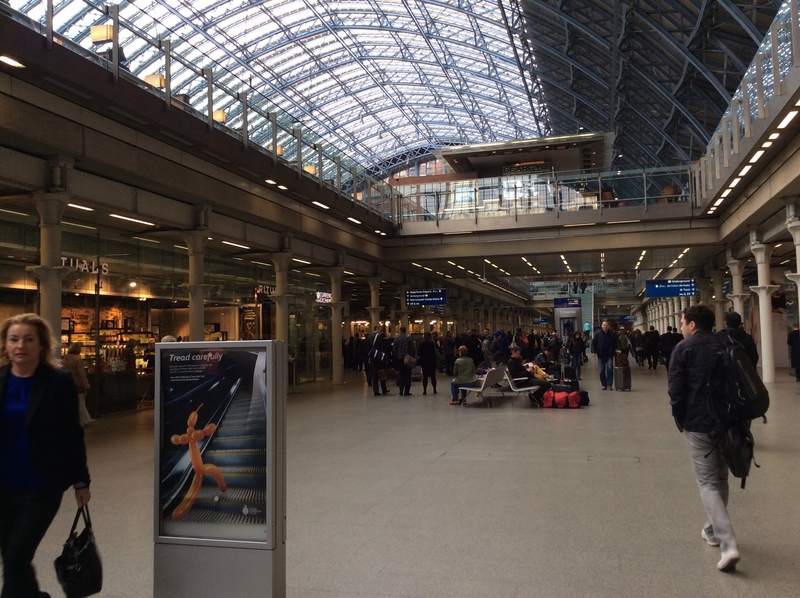 The train’s sleek, new, fast (only 2.5 hours from Paris into the heart of London), and well organized. It leaves and arrives on time. British customs officials scan passports in Paris, so that you just get off the train when you get to London and head straight to wherever you’re going. I was surprised at how much I loved hearing English spoken, hearing all sorts of English accents. I’ve been in France, doing so much language and culture and cooking immersion that I didn’t realize what a let-my-hair-down relief it would be to hear English. I arrived two hours before my appointment, so I got pounds from a bank machine and headed straight to Fortnum & Mason’s. They shipped me 20-40 green tins of tea for years, so I have an emotional attachment to them, and the tins, in which I still keep quarters and old washers and screws and things. My Fortnum & Mason lunch – Darjeeling and Welsh Rarebit. Lovely heart-shaped tomato, eh? F&M was the one place I knew where I could get great, fresh, loose tea before good internet distributors appeared on the scene. I moved between Earl Gray/Lapsang Souchang stages to Royal Blend, to Darjeelings and Orange Pekoes. My pots-of-tea a day habit continued with the focus and taste specificity of my current baguette obsession until I got Russ a Nespresso machine with those little pods of exquisite coffees with which you can make perfect cappuccinos and lattes and espressos. Within a week of getting that stupid machine, I’d gone over to the dark side. Daily breakfast switched from tea (with the huge pot in a cozy carried to my desk to sustain work-drive) to a remembrance of the favorite breakfasts of my life – hour and a half long conversations in my Spanish dorm over cafe con leche, pistolas (Spanish baguette equivalents) and very young Manchego sheep’s cheese. So you see why I have to make the best baguettes I can? Breakfast. But after spending 20 hours on the phone trying to get international specialist medical treatment lined up, with more phones that In can tell you that DON’T have answering machines OR secretaries, long conversations with high speed French with the exquisitely polite wrong person, I was feeling a little regressed. Tea and the-most-English-thing-I-could-imagine-to-eat felt like comfort food. 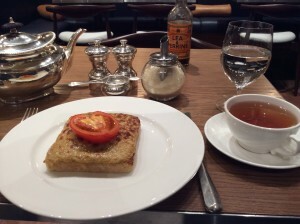 It wasn’t good Welsh rarebit – wildly over salted – but that was part of its charm and authenticity. It was so ENGLISH. And the tea was PERFECT. And it was served graciously. On silver. And everything was so CLEAN. The male waiters wore tails. Sherlock Holmes and Amelia Peabody and Dorothy Sayers and Elizabeth Barrett were just around the corner. I know it. After a lovely interval, I went to the hospital and was well cared for. The doctor and his assistant were very kind. And oh, did that doctor know what he was doing. He was brilliant. I had a glimpse of the National Health System (Britain’s basic care available to all), and also the private system, since I was a private patient. They were both extraordinary – the same doctors and treatments were available to everyone at this internationally-known eye hospital. I waited for my angiogram in the NHS waiting room, which was more densely populated with patients with the international flavor of the new Britain – lots of languages, a huge range of people from what seemed to be widely divergent backgrounds. One elderly, slightly demented man navigated his rolling walker over my foot as he looked for his ride home. Being my usual officious self, I took him over to the right desk and asked the receptionist if he could explain the taxi situation to the gentleman. The guy sighed and said, “I already have. Four times.” We grinned at each other and he started in on explanation #5. It was organized, it was good care, it reminded me of a US city downtown emergency room – lots going on, and a busy staff that was doing a good job. My doctor told me that they give 50 shots a day for macular degeneration. That’s a huge number. They’re falling behind, because of the aging population, so they’re putting in another surgical injection room. 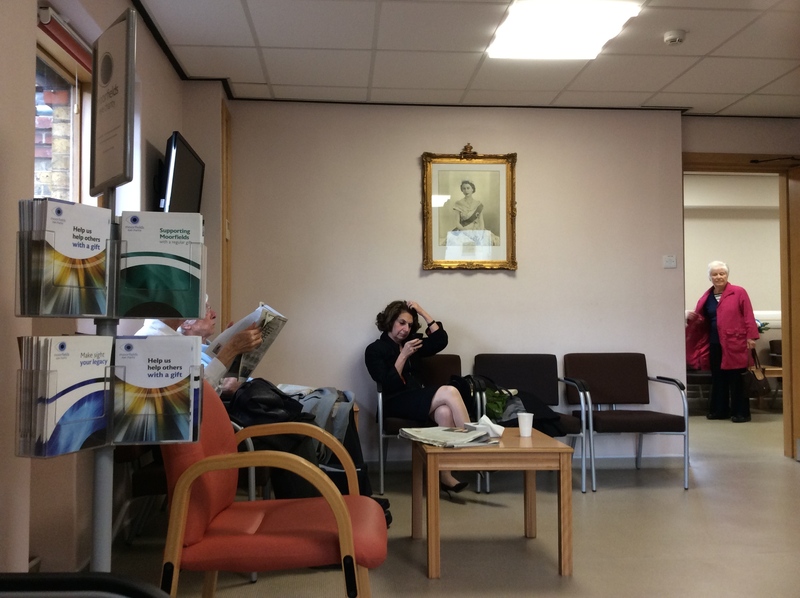 I love that the private waiting room has the OLD portrait of the Queen. How nice. The private waiting rooms were different. They were rather plain, but with very well-dressed people with Oxbridge accents. English men actually carry black umbrellas and look like they’ve emerged from Central Casting. A nurse came in and murmured, “Sir Robert Something?” A 20 year old stood, grinned, slung his backpack on his shoulder and followed her out. Queen Elizabeth oversaw goings-on in my second waiting room. I was comforted by the thought. I also had a fascinating conversation with a witty, older couple. The wife had a nasty complication from a glaucoma surgery the week before. They visited America the first time during the Bicentennial and toured the White House. The tour guide gestured to vestiges of fire damage from British troops burning the building in 1812. The couple formally apologized to the group for British rudeness. I told them the story about Dolley Madison serving 24 for dinner, but having to race off to save George Washington’s portrait and a bunch of state documents before the Brits arrived. The officers ate the dinner, drank the wines, THEN torched the place. My new friends mentioned as how their forebears were rude, but not stupid. “It’s called foraging,” explained the account husband. So after all the hospital things were done, I went back to my Travelodge (179 pounds a night – the hotel, not me). It had been the only thing available, and, as two Australian guests told me when I asked them if THEY had a phone or a hair dryer in their room, “No. No phones or hair dryers, but now they do give us the little bottle of soap that you can also use on your hair. It’s rather basic.” But anyway, that evening I wandered happily around Euston Square in search of the perfect English Dinner before I came back to France. I was NOT looking for tinned peas, so I found an Indian restaurant. It was pretty bad, but what a nice evening. My beloved who is hiking across the north of Spain on the Camino of Santiago de Compostela, called as I was ordering my Chicken Tikka Masala. I overheard conversations in French, some Indian language, and three English accents. I paid my bill and the waiters raced off around the corner. I was pinned like a butterfly against the wall by a huge 1930’s mahogany veneered table and two massive wooden chairs. Four beefy, middle-aged guys with Alfred Doolittle accents had just sat down at the table next to me. There was about four inches of clearance between tables. I couldn’t crawl under because of all those table legs. So, I asked the guys if they’d have any interest in rescuing me. Two of them leaped to their feet, one saying, “Yes, of course, because we are English gennlemen.” And they freed me. I assured them that I had wanted to be rescued by English gentlemen for the better part of my life and thanked them very much. They introduced themselves, invited me to a second dinner. Who would have ever thought it would be such a great day? This entry was posted in Sabbatical, Travel Discoveries and tagged Americans who love Britain, Dolley Madison, Harry Potter, Martha Grace Reese, Moorfields Eye Hospital, National Health, NHS, Platform 9 ¾, Robert Browning on May 5, 2014 by Martha Grace Reese.